Welcome to another Tablescape Thursday with our hostess with the mostest, Susan at Between Naps on the Porch! 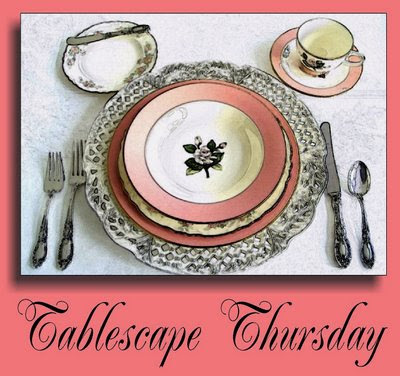 Be sure to drop by her amazing blog to see one of her beautiful tablescapes and to find a list of this week's participants! 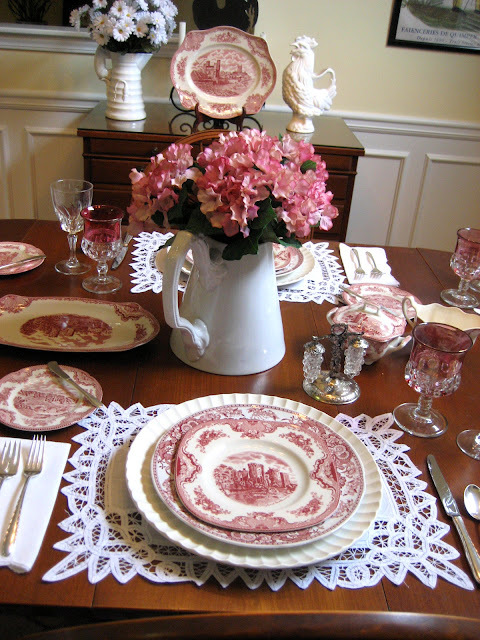 I am calling this week's tablescape Le Château de ma Mère, in honor of the French novel by Marcel Pagnol and the film by the same name...My Mother's Castle...because I am using my Old Britain Castles china for Mothers Day! We will be having a special lunch in my sunny dining room. 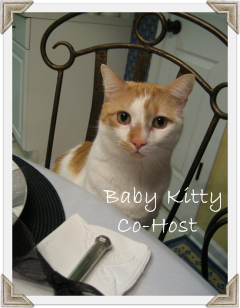 Our co-host today is Baby Kitty, who is very excited, because, as some of you may know, he considers me his mother, since I bottle fed the little rascal from the day he was born! He is taking particular interest in seeing that the table is set just so! 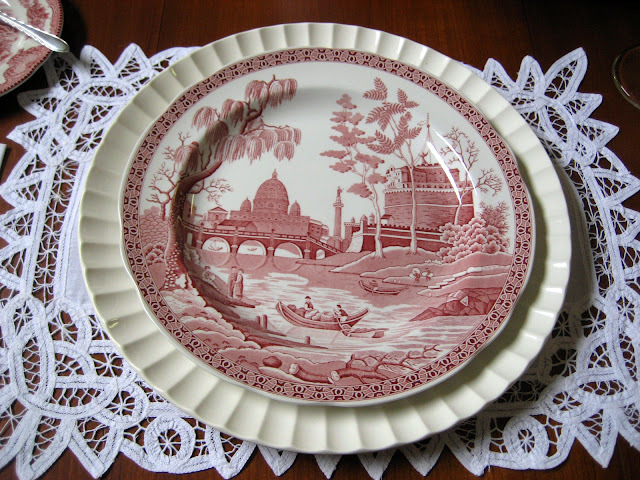 To add a little interest, I am using the Old Britain Castles in combination with my Spode plates from the Archive Collection of the Georgian Series. I used two different shapes of salad plates as well. ...and two of the places are set with the square! I really like these! I think they add a little something unexpected. I am also using four different Spode plates to add even more interest. This one is called "Girl at Well." This one is called "Woodman." This is my favorite. It's called "Rome." And finally, this one is called "Botanical." I love the creamer and sugar from the Castles pattern...especially the sugar bowl. It looks like a little tureen! I found these salt and pepper shakers at a little antique store near me. Aren't they cute? I can't resist anything with grapes on it! 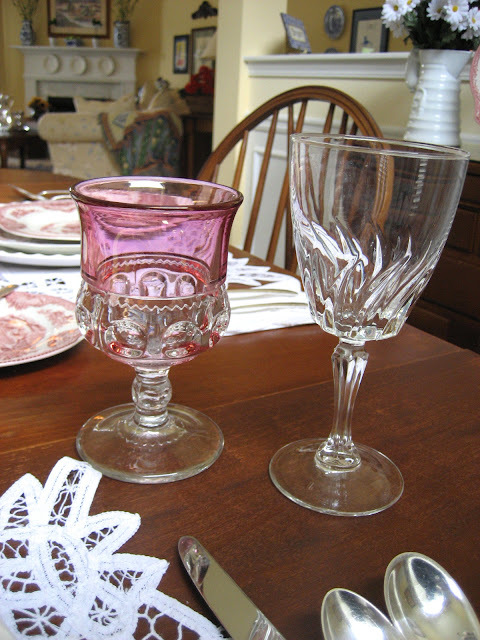 I am also using my mom's Kings Crown goblets. The wine glasses were Goodwill finds. The center piece is my favorite frenchy pitcher from Marshalls filled with faux hydrangeas. The flatware was my mom's...Towle's Silver Flutes. And there you have it ...my Mothers Day tablescape...le Château de ma Mère! I hope you enjoyed it! Thanks so much for stopping by! Be sure to head on over to Susan's to continue your tour de tablescapes! A la prochaine...see you next time! Oh this table is just fabulous! I love your dishes the table and the whole room! 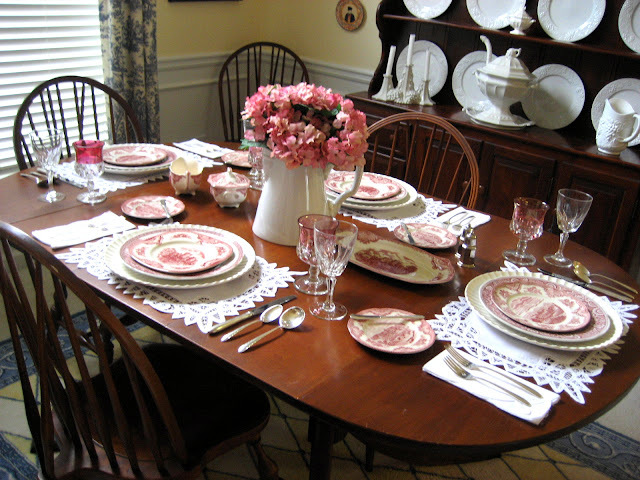 Your mother's day table is so pretty in pink and white. oops, my computer hiccupped, and is very slow. I will delete the extra comments. Hi Debbie, you always have such lovely tablescapes and I am in love with the grape salt and pepper shakers. 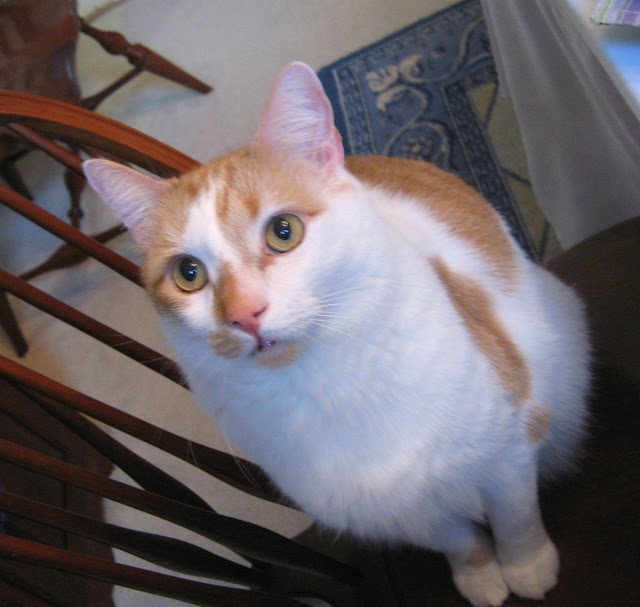 Baby Kitty is a lovely dinner companion. May I sit next to him? PS - Love your new look! 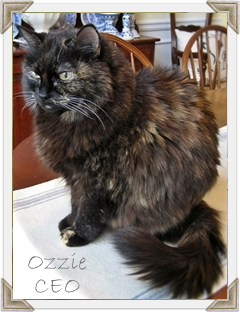 We also hand-fed our two oldest furr babies, so that comment made me tear. :-( Hugs to Baby Lily...and to you, too. So pretty, love all the matching combinations ! Lovely lace placemats too. The botanical plate would be my favorite. The lace placemats are a real bonus. Thank you so much for sharing with all of us. Deb... first... I forgot to tell you I love your new banner... I personally like changing my banner frequently... it's that restlessness in me from being a Naby brat I suppose! 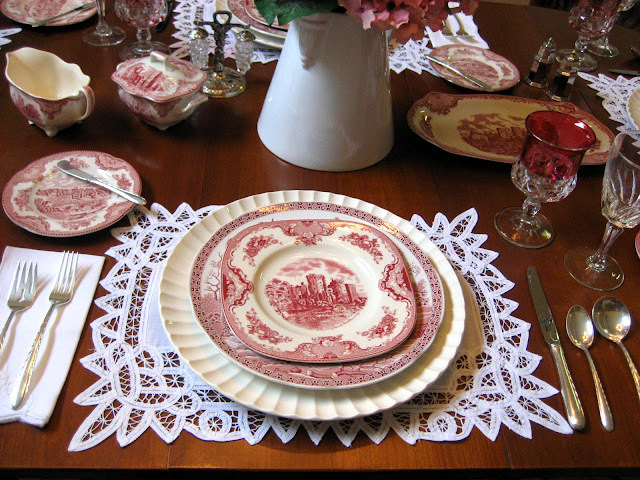 and I love those battenburg lace placemats... they make any table setting special! Oh how I heart that white soup tureen on your hutch. What a beauty! Oh you do have such pretty treasures! I do love the pink and white. Just perfect! I have a few pieces of Britain's castles, too, and it's the next best thing to being there! I adore your collection! Evening, Dear Debbie! You never disappoint! This table is so beautiful and how I love that expression on Baby Kitty's little face! I would be proud to sit at your table! 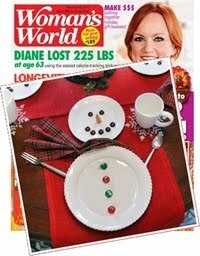 Beautiful tablescape, Debbie! The s&p's are adorable, good score. Debbie, Your table is a depiction of everything I love! 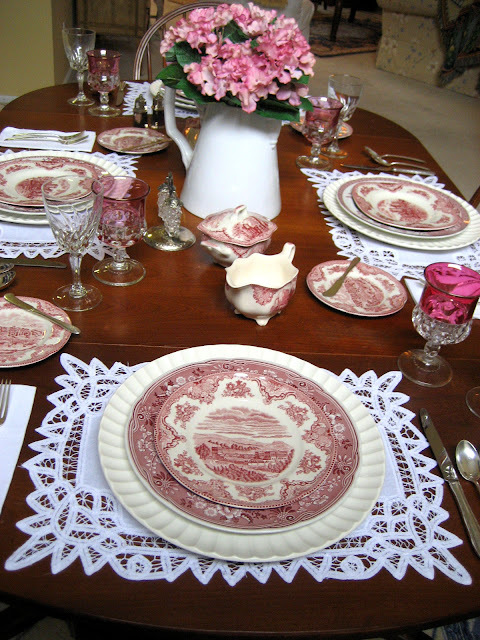 The battenburg placemats are lovely beneath the red transferware. I love it all! I also own a pair of s&p shakers just like yours. They are fun, aren't they? Just beautiful, Debbie. I adore those plates and set on top of the battenburg lace really frames them so pretty. Tres jolie! Beautiful Frenchy table as usual...Happy Mother's Day and I'll miss not seeing you next Wednesday.....Sue. Debbie, that little kitty cat is looking at you with love and trust in his eyes. Your table is lovely as always. I love the mix and those square plates really add to the layering. I hope you enjoy a happy and blessed Mother's Day. This is so beautiful! Your plates are just wonderful. The color and design...everything looks perfect. I like your hutch with the white plates...wow. Love it all. Debbie, those are some gorgeous plates! Wow!!! I want the Spode "Aesop's Fable" in either green or pink. I've seen the Rome one at Tuesday Morning. It is beautiful! Beautiful tablescape, as always! 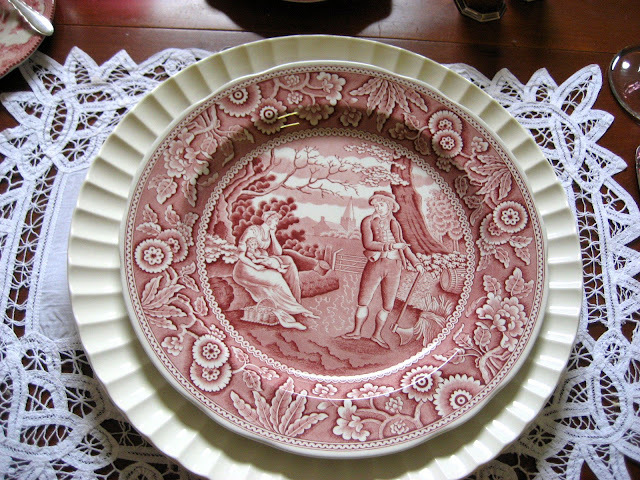 I have some mix and match pink Spode plates as well, and have the same ones you do. I'm seeing more pink and white transfer which I've always turned my nose up at because my love is blue and white. Perhaps I shouldn't -- it sets a lovely table and I think mixing the patterns make for an interesting table. I have the same Spode as you only in blue and white -- very very lovely. A great table -- now to see if I can find that creamer and sugar in blue and white! First of all I think you have a whole new look on your page...am I right? Very pretty. Tell Baby Kitty he did a great job. Every detail is complete. My favorite Spode plate is the Botanical. And your mom's Kings Crown goblets look like the same ones in my deck table. 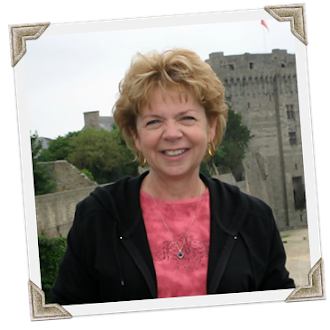 Thanks for stopping by my blog and leaving me a comment. I haven't had much time since I started working to read everyones blogs or even write much that's new, and I miss that the most. Hope you have a great weekend as well! Ok. I'm comin' to suppa'! I'll bring the strawberry torte! Yes you can get the coasters wet. I relly love mine, cause they really drink the condensation. 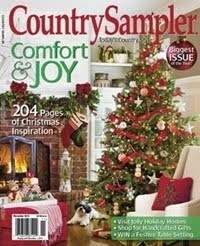 I have mine on an antique table, but sample yours first to see how they do. Chocolate milk, soda, has over-lapped onto mine. The spill makes them even look great, before I wipe clean them up! OH Yeah. If you like, "A Good Year", you are gonna love the next post! Nous n'avons pas été trop tard! Car il n'est jamais trop tard! Debbie it's all so gorgeous and cheerful! 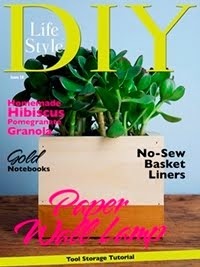 Love the botanical plate and the S/P shackers are precious. Baby Kitty just loves you so. You can tell by the look in those pretty green eyes he adores his Mama. Thanks for reminding me about the deer repellent. 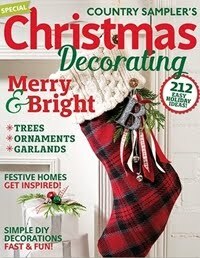 I forgot they sell that at Lowes. Have a blessed and beautiful Mother's Day! PS Your blog dress is stunning! That's a gorgeous tablescape! You know I LOVE it! 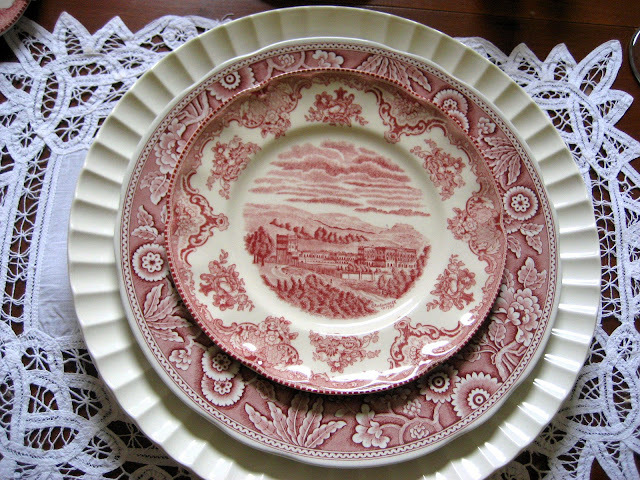 I only have two Old Britain Castles plates, one in red and one is multicolored, but I do have those Spode dishes. They look great with the plated with the fluted edge! I also love that you used the square plates! The salt and pepper shaker is just too cute! Beautifully coordinated and well thought out tablescape for Mothers day! I also love that photo in your header! I wanna be there! Your tablescape is fabulous. 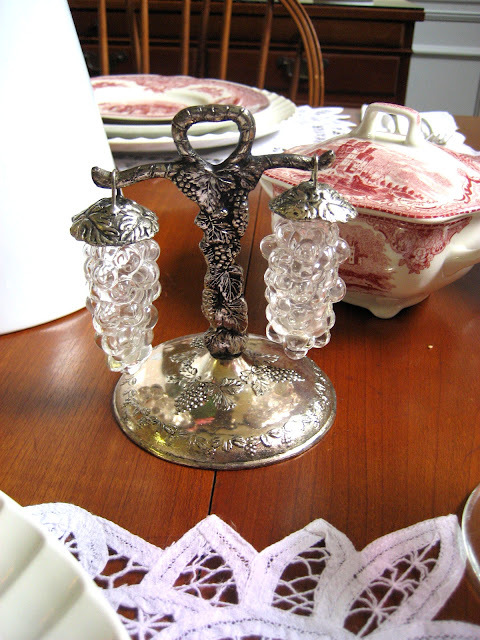 I have always loved Spode's Castles and those salt and pepper shakers are adorable. Ohhhh Darlin'...your Mother's Day table is so grand!!! 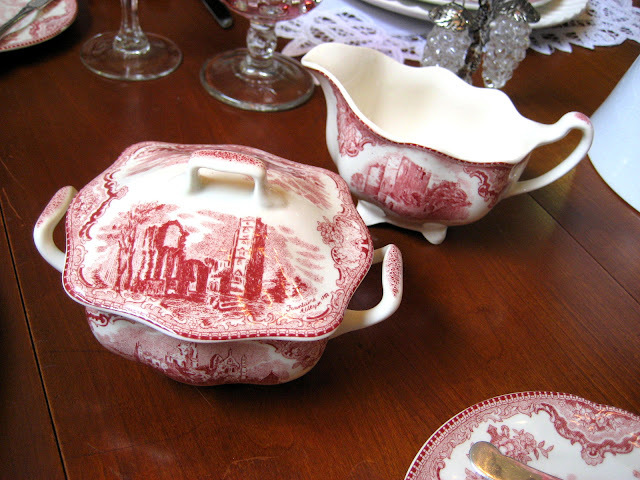 Of course, you know that I'm a lover of all pretty red transferware!!! I really enjoyed looking at all of your different plates...I love the one you called "Girl at the Well"...so pretty!!! Love your pretty white lace placemats too...the placesettings look beautiful on the white!!! And of course, the pretty french pitcher full of hydrangaes is just perfect for this tablescape! It's lovely, my friend!!! Sending you my very best wishes for a wonderful Mother's Day!!! 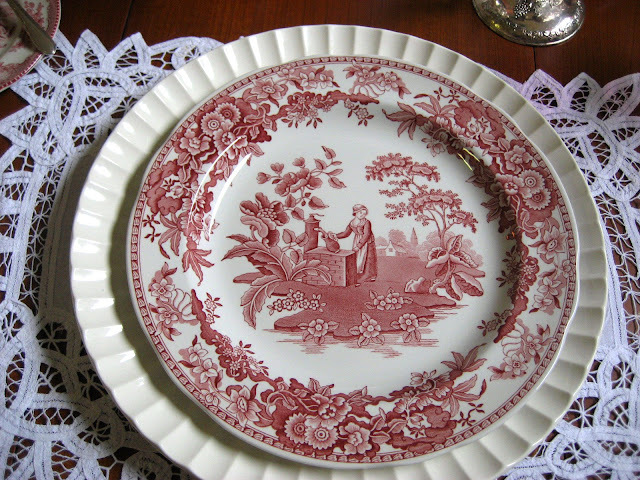 Oh, I am in instant love with your Spode plates! I must look for some. Especially the botanical one, as I love gardening so. 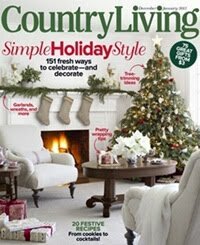 You have set a table worthy of a magazine cover. Really! Oh this is sooo beautiful!!! I adore the Spode!!! All of your special touches just make the table. What a wonderful Mother's day table!!! 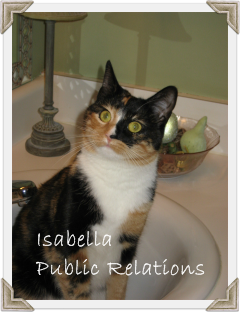 The pic of your precious kitty looking on is just adorable!!! Magnifique! Is that how you say "mannificent" in French??? It would be "magnifico" in Spanish. No matter the language, I think you get the sentiment. Love it! uh.... "magnicent" I need new glasses! LOL! Bonjour! Je suis la mere pour mon chat aussie! Your table is beautiful, as are all your kitties! This tablscape is so delightful!, soft and sweet and Oh so frenchy and the same time!! Love your dining set and buffet also!! This whole setting looks so inviting! I would love to join you and your kitties any time!! Your guests are going to love dining at the beautiful table. Your tables always look fabulous - I really like the looks of this one with the different chaped dishes! The 'grape' s&p are so whimsical... what a conversation piece! Fabulous table. I only have a few of the Old Britain Castles plates. I would love to have an entire set. Maybe someday. 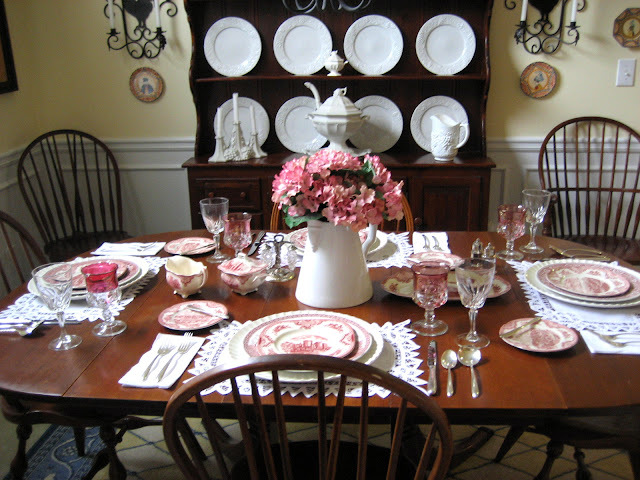 I love your tablescape & how you mixed the Spode plates with the Johnson Brothers. And I love how the rest of the room coordinates with the table. Your tablesetting is exquisite...i enjoyed seeing how you put all the elements together. I smiled at the Spode Blue Room plates. i have botanical in blue for my blue and white teacup collection, and Rome also in blue for my b&w collection of plates of places I've visited. Looks like your lil' helper know how to set a grand table. 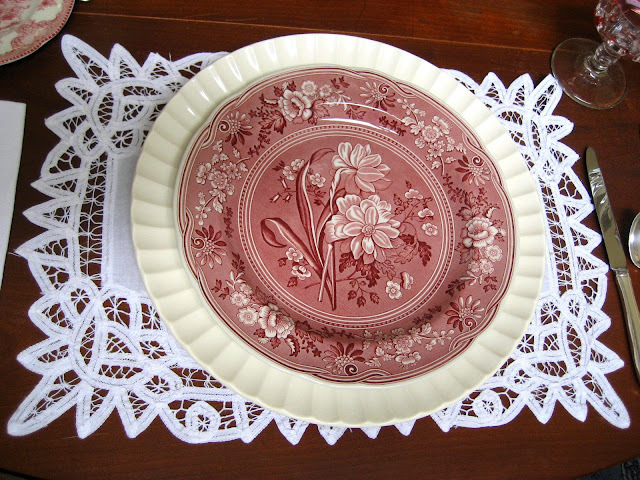 I loved the combination of the red Spode with the white battenburg lace placements. I've got red accents in my kitchen and living room. 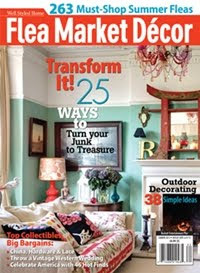 I was always intimidated by red for decorating. Now that I have it throughout my home I can't imagine it without. The little grape S&P shakers were the pièce de résistance. Your moms day table was a sweet way to share your mom with us. 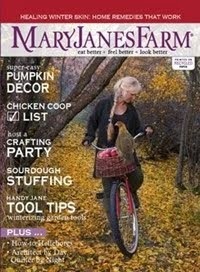 I hope you can come by and see my Mothers Day gift ideas. Yes, I enjoyed your Mother's Day tablescape! I love your collection of china! I like how you mixed the Spode in with it..
Just beautiful. Love the salt and pepper shakers - they are so unique. Your little baby is very lucky. a lovely tablescape for any ocassion. Especially for mothers. I hope your Mothers Day is one of the best yet. Loved all the different pictures and the your Marshall'spicture in the center. Here I am, late as usual! I am going blind trying to visit everyone! LOL!! Have a wonderful Mother's Day, Debbie. Oh, I LOVE THE COLORS! It's so soft and perfect for Mother's Day! I am in love with the grape s&p holders! Aren't they FANTASTIC!! This is the perfect table! Debbie, I absolutely adore this tablescape! I have a set of Churchill dishes that I have wanted to post, and had it in my mind to do something very similar to this. I love your little sugar bowl, it does look like a little tureen. This is just beautiful!! I have a very similar salt & pepper shaker set, except my grapes are purple. My grandmother got it in Germany a very long time ago. She gave it to me since it was just sitting in her cabinet. Where did you get your battenberg placemats? I have two that I purchased about ten years ago, and I need four more. This is just so pretty! I love the dishes and colors and how you have everything arranged! 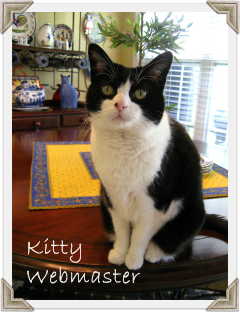 Your sweet kitty is adorable!